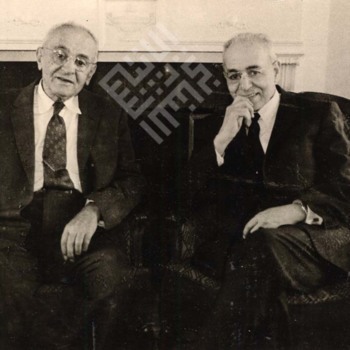 A portrait photograph of Wadea (left) and Aelyas (right) Kassab. A photo of Linn, Roger, and Phyllis Creighton on a path in the Royal Botanic Gardens in London. A photo of the Creighton children (left to right: Phyllis, Roger, and Linn) feeding a deer in Richmond Park, London. A photo of two of the Creighton children at a summer resort in Shweir, Lebanon. A photo of the three Creighton children at a summer resort in Shweir, Lebanon. A photo of Phyllis and Roger Creighton at a summer resort in Shweir, Lebanon. A photo of the three Creighton children (from left to right: Linn, Phyllis, and Roger) at a summer resort in Shweir, Lebanon. A photo of the Creighton family on vacation, including Clara Creighton and her three children, Linn, Roger, and Phyllis. A photo of Linn, Roger and Phyllis Creighton at a summer resort in Shweir, Lebanon. A photo of Roger and Phyllis Creighton at a summer resort in Shweir, Lebanon. A photo of the three Creighton siblings sitting by a pool, possibly the same garden pool, or 'birki', that they posed in front of with a donkey. A photo of the three Creighton children on a donkey in front of a traditional garden pool called a 'birki'. A photo of a kindergarten class. The two blonde children in the back are the younger Creighton siblings, Roger and Phyllis. A photograph of Lama Abou-Chakra with her brother and sister.